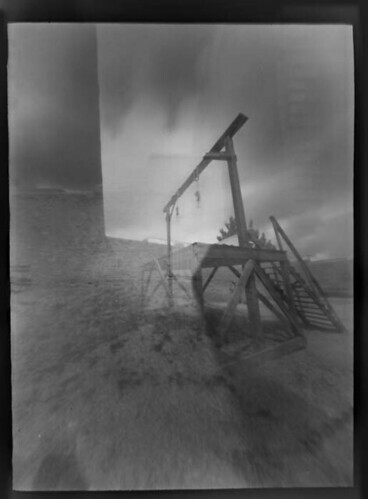 D Stewart PDX's famous "Terminator 3" pinhole camera, Fuji ACROS ISO 100 film, double exposure, 1 second each of the gallows, and a prison yard wall/door. Film was developed in homemade "caffenol" developer. Negative was photographed over a lightbox with a DSLR, post-processing in Photoshop. This image is a double exposure- the first being a shot of a prison wall and it's door to the outside world. The second image was of the gallows. I just love the long, wide angle, and tunneling effect of T3! This is a replica gallows- nobody was actually hung from this structure. The real gallows was burned (deliberately) after the county seat was moved to Bisbee, and the courthouse was no longer used in a public/government capacity. The courthouse was used from the 1880s through the 1920s, before the Cochise County seat was moved to Bisbee, about 20 miles away.